Google has launched a version of its Android Auto software that can run entirely on an Android phone, rather than requiring a new car or aftermarket dashboard display. Originally unveiled during the company’s annual developers conference this past spring, the app is essentially a streamlined, easy-to-navigate phone interface for when you’re driving. There’s a home screen area with cards showing your currently playing music, weather information, and suggested directions based on your recent search history. You can access a handful of key apps that have been simplified to be safer for use in the car — with big text and buttons. Some of these apps include Spotify, Pandora, and Google Play Music, as well as Google Maps, Android’s Phone app and more. Google says that any of the 500+ apps that have been previously supported in Android Auto will work within this application interface. One that’s notably missing is Google-owned Waze. Also absent at launch is the ability to say "OK Google" to trigger voice control within Android. Currently, you have to tap on the microphone icon to use them or press the voice command button on the steering wheel in some compatible cars, so you can have your text messages read aloud to you and to respond to them using voice. Like similar third party solutions, you can set the app to autolaunch when your phone wirelessly connects to your car’s Bluetooth. Google says Android Auto has shipped on more than 200 car models this year so far, and is available on a multitude of aftermarket display units as well. With large-screen smartphones becoming ever more popular, offering a standalone Android Auto experience makes sense, all you need is need a phone running Android 5.0 Lollipop (or higher) and a car mount. 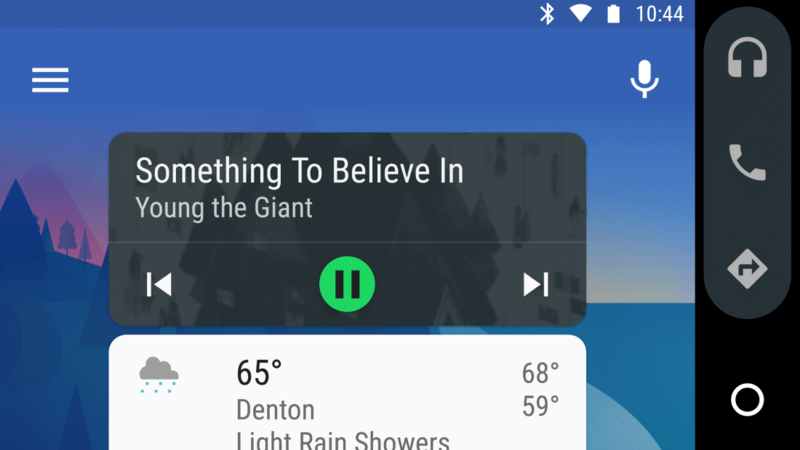 The new Android Auto app is an updated version of the existing app that previously required tethering to a car’s infotainment system. It will be rolling out in the coming days to more than 30 countries where Android Auto is currently available.